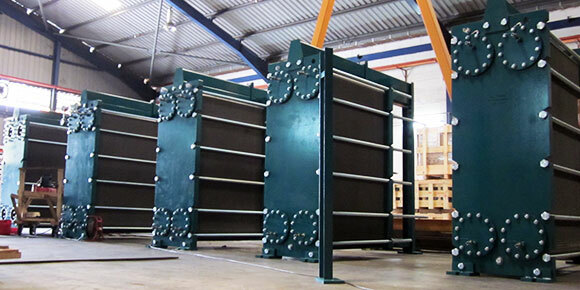 Plate Heat Exchangers (PHE) are heat exchangers made of thin sheets of corrosion resistant metals compressed in between two metal frames. 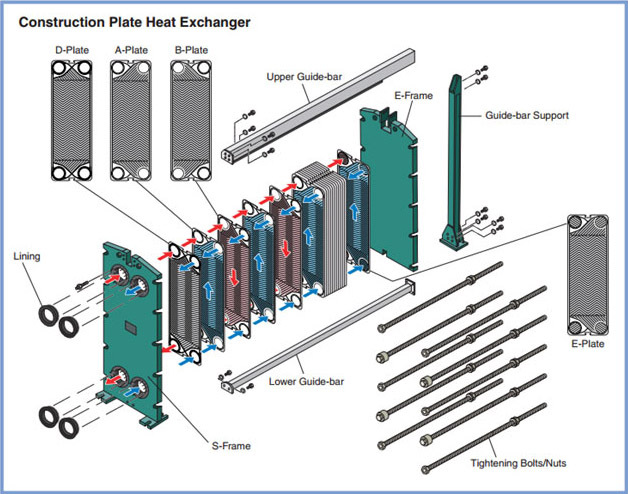 The function of a Plate heat exchanger is to cool down or heat up a particular flowing liquid. This is done by applying thermodynamics concepts to transfer heat from two counter current flowing liquids of different temperatures. The heat transfer Plates are made of thin sheets of corrosion resistant metals such as stainless steel or titanium that are press-formed with a corrugated pattern on the surface and sealed with synthetic rubber gaskets, which seals the flow channel and directs the fluid into alternate channels. Such Plates are suspended, supported and aligned by guide bars and are tightened with bolts between a fixed and a moveable frame. The overall heat duty can be adjusted by modifying the number of heat exchanging Plates. Heat transfer A and B-Plates have identical pattern, wherein a simple upside-down turn will make each Plate into one and another, so as to obtain a different flow channel controlled by the gasket line. Furthermore, with the start Plate (D-Plate) having portholes with double sealed gaskets and ends with a blinded E-Plate, this construction ensures that the fluids do not come into direct contact with the frames. HISAKA products are used for heating, cooling, heat recovery and fluid control in chemical plants – such as caustic soda, fertilizer, petrochemical, oil refinery, oil & fat, pharmaceutical and many more. HISAKA products are used in processes for dyeing and finishing of various fiber materials, such as synthetic fiber, composite fiber and natural fiber, which are used for clothing, building interiors, industrial materials and so on so forth. In the food industry, HISAKA products are used in various kinds of processes, such as sterilization of ouch foods, steaming, cooling, steeping and cooking of food materials, and concentration and drying of extracts. In the Beverage industry, HISAKA supplies sterilizers for milk, soy sauce, beer, spirits, tea, soft drinks and many more. Additionally, HISAKA also provides other equipment that is indispensable in their plants. In steel mill, HISAKA products are used of heat exchange and fluid control in blast furnace, galvanizing, C.O.G., casting processes, and in smelting nonferrous metal such as copper and nickel. As for other metals production, HISAKA products are used during plating, quenching, anodizing, painting and many more. HISAKA products support engines and other onboard equipment and systems with high safety and reliability. Marine applications include for sea water, river water, power station, and many more. HISAKA products are used for maintaining pleasant environments in factories, commercial facilities and office buildings. HISAKA products are used in processes for manufacturing engines and electrical components for automobiles as well as other machineries. HISAKA products are used in various types of plants that product and/or supply the energy necessary for daily living and economic activity – namely coal, oil, gas and electricity. HISAKA products are used in processes for pulps and paper manufacturing, such as during black liquor digestion, white liquor digestion, digester, heat and chemical recoveries and many more.